Vandervest Harley-Davidson® is a ten-time Harley-Davidson® Bar & Shield Winner for their excellent "Customer Service"! At Vandervest Harley-Davidson®, we know how important your Harley® motorcycle is to you! 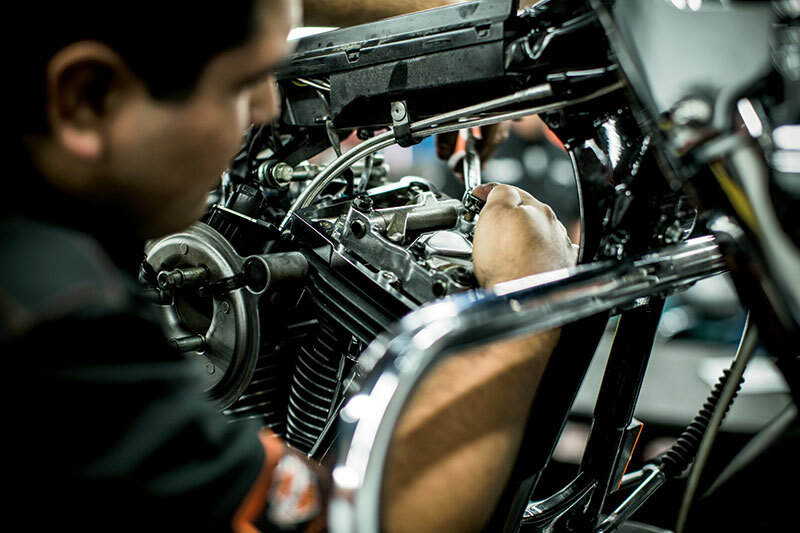 Factory-trained PHD Certified Technicians are ready and waiting to work on your Harley® motorcycle. Technology is constantly changing and only a factory authorized Harley-Davidson® dealer can keep you and your Sportster®, Dyna®, Softail®, V-Rod®, Touring, or CVO™ up-to-date with the constant changes in the design and function of your Harley-Davidson® motorcycle. We have the experience, tools and the training to keep your Harley-Davidson® running at peak performance. Our P.H.D. certified technicians take every step necessary to give you peace of mind while cruising down the open road. "Our policy is to treat each and every Harley-Davidson® motorcycle that comes into our shop as if we owned it ourselves." We have invested in state-of-the-art service equipment to make sure the job gets done right, including computerized tire machines, hydraulic motorcycle lifts, computerized diagnostics, a wash bay, and a DYNOJET™ machine. We strive to keep a clean and organized service area which is always open for the public to see. Have your Sportster®, Dyna®, Softail®, V-Rod®, Touring, or CVO™ serviced by one of our P.H.D. certified technicians. Call for your appointment today at (920) 498-8822 in Green Bay. Vandervest Harley-Davidson®, "It's Where You Want To Be!" Our experienced factory trained technicians and outstanding service staff are here to keep you and your Harley-Davidson® where you belong; on the road. Schedule your appointment and have your Sportster®, Dyna®, Softail®, V-Rod®, Touring and CVO™ maintained by a Harley-Davidson® Certified Technician.